As the dry summer weather lingers, boaters need a little extra vigilance when navigating ever-changing rivers and reservoirs as different hazards come into play when water levels change. Boat with a buddy, especially in paddlecraft. Have at least two boats and a plan if the party is separated. Always let a friend or family member know where you're going, when you expect to return, what clothing you're wearing, and who's with you. Keep a proper lookout and look what's ahead, not what's just in front of you. Scouting ahead is worth your time. Determine the safest course around boulders, gravel bars, or fallen trees/root wads. Read the water. Where is there whitewater? Where does the water eddy? How is the water riffling? These water characteristics indicate what's below the surface, a sense of depth and gives key information on how to safely navigate. Go with your "gut feeling." If something doesn't feel right, listen to your gut. 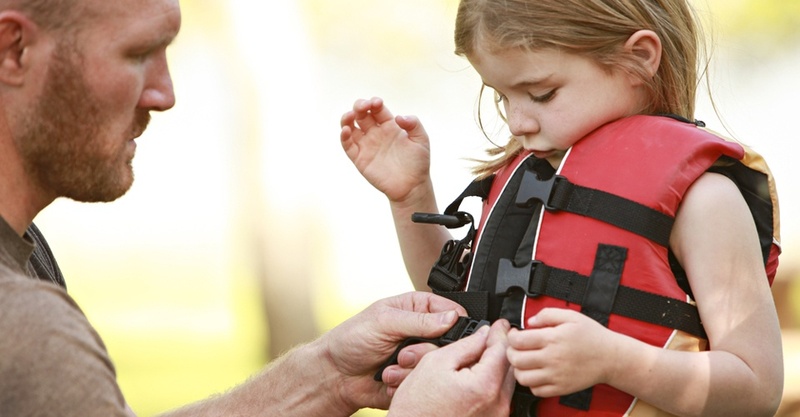 When in doubt, portage (drag or carry) the boat over and around an obstruction. Skill level and confidence can mean the difference between an easy run and a potentially dangerous one. Stay well clear of log jams and strainers (root wads, trees, branches, logs). They allow water through them, but can catch and entrap paddlers underwater or entangle lines on boats. Know your limits. --Not when you're at your best, but at that specific moment. Stick to rivers with Class I or II rapids unless you have the skill and conditioning for advanced water levels. Use the right gear for the type of boating. When running Class III or higher rapids, a helmet, properly fitting life jacket, a throw bag and secured gear are incredibly important. On reservoirs and lakes, sharp drop-off's are a given. Tree stumps, boulders and fallen trees may not be visible. Take special care when operating near the banks, where many of these obstructions lie just below the surface. Always wear a life jacket when on the banks. Banks are often unstable. On coastal bays, pay attention to the weather and the tide. A receding tide could leave a boater "stuck" at the wrong place at the wrong time. We’ll add one more thing to the Marine Board's list: take an emergency care training class so you’ll be ready to respond in case of a medical emergency. It’s especially important for boaters to include CPR in that training, as drowning can result in secondary cardiac arrest. With no incoming oxygen, the heart progressively becomes weaker until signs of life become difficult or impossible to assess. If the heart is simply too weak to create obvious signs of life, immediate CPR, with an emphasis on effective rescue breaths, may be the only chance to restore a patient. When performing CPR on a drowning victim, get them as quickly and safely as possible onto solid ground. Expect vomiting when performing compressions. Do not attempt to expel water using abdominal thrusts. To find an ASHI or MEDIC First Aid training class near you, click the big button below.